Pi is a pretty special number. It is an irrational number (I can be irrational sometimes too, but my love of pie is all reasonable). The date 3/14 is known as Pi Day because it represents the 1st three digits of pi. It is also the birthday of Albert Einstein, who was born in 1879. Pie is also a pretty special. It can come in many different diameters. It can be made with sweet or savory fillings. Pies can be rustic or intricate. Pie crosses borders, cultures, and family lines. It is vintage and old school as well as hip and current. Harry Hamlin was even featured baking pies (it’s because he’s an awesome Canadian) for Lisa Rinna and his BBQ on Real Housewives of Orange County. If you live in the Boston area you have some excellent options for places to pick up a slice of pie, pie for lunch or a whole pie for your squad. The Go Local Boston Crew got together over the past few weeks and sought out some of the best pies in town. This year, snow is predicted on Tuesday, so you may want to head out today or tomorrow to pick up your celebratory pie. If you cant’d decide you just have to try them all. Share one with a friend and then bring one of each home to keep in the freezer. With the snow on its way you might as well stock up! Pies, pies and more pies from KO Pies in Boston. From close to home to 1/2 way around the world, in provenance at least, is KO Catering & Pies. A great choice for the savoury pie seeker. I suggest meeting a friend for lunch at KO Pies in South Boston or East Boston and then pick up a few heat up at home or to freeze. An Aussie pie with a bowl of soup or a salad makes the perfect winter’s dinner. The KO Pies crust is perfectly flaky and the filling is plentiful. The flavours of the fillings all stand up to the richness of the crust whether it is the classic beef, Aussie lamb filling, or curried vegetable. I have been a fan of KO Pies for a very long time and the Go Local Boston crew were lucky enough to be invited in for a tasting for this pi day piece. We sampled the Classic Beef Pie, Braised Lamb Shank Pie (my favourite), the Curried Vegetable Pie (I loved this vegetable option), and the Pie of the month which is a Pulled Pork Pie (so good I brought one home!). Back on my side of the river is the perfect place for those who want to try all the pies. Petsi Pies has pie by the slice and they are the gold standard of pies in the Boston area in my opinion. You can go savoury with something like their bacon, leek and gruyere pie or their chicken pot pie, but don’t leave without some sweet pies (at least a couple of slices). Pies come in 5″, 8″ and 10″ sizes as well as select pies by the slice (and there are always many to choose from ). Isabelle’s favourite is the cherry crumb pie and mine is the brown butter pecan pie, but I have not had a single slice of Petsi Pies disappoint yet. 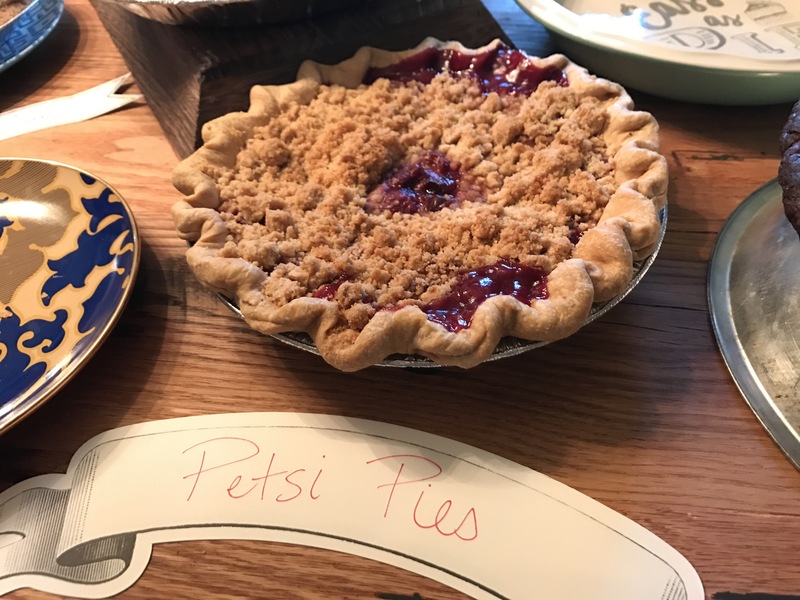 On Pi Day, stop by Petsi Pies on Beacon Street and ear yourself some free pie. Recite 10 digits of Pi and get a free cutie! Recite 100 digits and get a gift card for a free pie! Recite 314 digits and get a free pie per season. Contest goes until the pies are all gone. Pemberton Farms has slices of cakes and pies as well over by the deli counter. You can also pick up a whole pie as they stock The Pie Guy’s pies from New Hampshire. They are not in a pretty pie box, but they travel well in their pie clamshell box. Their key lime pie is the one we picked up to try and Key Lime happens to be one of my kids’ favourite pies. It is dissapearing fast. I’m not sure it will last until actual pi/pie day. Pies from Mariposa Bakery in Central Square, at the Somerville Winter’s Market. Blackberry ginger hand pie from Mariposa Bakery. Pies at the Somerville Winter Market from Mariposa Bakery in Central Square. Pick up some hand pies at Mariposa Bakery at the Somerville Winter Farmer’s Market on Saturdays or at their café in Central Square, Cambridge. I loved their blackberry ginger hand pie and today they had mini pies including one that had grapefruit curd and was topped with a blueberry (or was it blackberry?) jam. I was so tempted! If you are running errands at the market this weekend, skip the usual grocery store (if that is your usual) and shop at Wilson Farm, Verrill Farm or Volante Farms. They all have great options when it comes to pie. I love Verrill Farms’ apple crumb pie. Wilson Farm sells their own pies as well as Aristocrat pot pies. Volante Farms sells a variety of pies including Ever So Humble Pie Co. or you can pick up some apples at Volante Farms and try one of these pie winning recipes. If Volante Farms is not on your route, then you can also pick up some Ever So Humble Pie Co. pies at Brothers Marketplace. Also on our radar is newcomer Shoofly Pie Company. You don’t have to eat pie on Pi Day you can also just order your pie for the weekend. This week’s pies available for delivery are a cauliflower, manchgo, rosemary pie which is available gluten-free as well (although I believe it is not a strictly gluten-free kitchen so please check first if that is important). The sweet pie of the week is malted double chocolate pie. I love anything malted so this sounds pretty amazing. The chocolate mocha cream pie from Rosebud American Kitchen & Bar was pretty perfect. If you want to just enjoy pie while you’re out for dinner, lunch or brunch, then check out some of these spots. Southern Kin Cookhouse at Assembly Row has a wonderful selection of pies that you can order straight up or à la mode. The crust is nicely crimped, thick, crisp and slightly caramelized. On the menu at Southern Kin Cookhouse is a buttermilk pie, Pappy’s mud pie (for the chocolate lover), Georgia’s peach crumble pie, key lime pie, coconut cream pie, and brown butter-bourbon pecan pie. Also serving up pie is Rosebud American Kitchen and Bar in Somerville’s Davis Square. You can get a slice or order a whole pie. This month’s flavours are: mocha cream, Dutch apple, blueberry crumble, cranberry pear, and peanut butter fudge. This is Southern Kin’s buttermilk pie. It is served with whipped cream and strawberries and tastes of places that don’t have snow this time of year. That should get you started. If you have a different spot to recommend let me know in the comments. I’d love to hear about your favourite local pie, road trip pie or pie recipe! And if you just prefer cheesecake to pie then head over to 7 ate 9 where they are letting everyone know that pi ≰ pie. The Go Local Boston crew, which includes A Little Bit About A Lot of Things, Capability Mom, and KimWorld each had their favourite pies. I had a new pie to add to my favourite KO Pies and Petsi Pies, which was Verrill Farm’s apple crumb pie!